You can buy Learning Matters on Amazon here. “This is a crucial time for English education. Teachers are burdened with an unsettling and ultimately destructive culture of command and control that has persisted for more than two decades. Roger Titcombe provides a critical and penetrating overview of these matters, while offering robust and well researched proposals on how the fundamental issues can be addressed. This book gets to the heart of the problem and deserves to be widely read, not just by educationalists, but also by parents and all those who are concerned by the current state and direction of the English education system.” Maurice Holt, Emeritus Professor of Education, University of Colorado, Denver. “There are many parts of this book that I embrace whole heartedly and other parts I disagree with, but all of it I find stimulating. It offers a fresh, challenging, well researched and well argued approach to the question of what makes for a successful education. Parents, teachers, educationalists and – most of all, politicians – should all read it.” Peter Saunders, Emeritus Professor of Sociology, University of Sussex (also Professorial Fellow at Civitas). “The GCE O-grade was achieved by less than 20% of the whole population. Yet now more than 50% of the population gets C-Grade GCSE. Are standards really rising or is this an illusion? If teaching-to-the-test undermines understanding, then what kinds of learning promote cognitive development and hence better understanding? Titcombe addresses this question and also analyses the success of Mossbourne Academy to argue how the whole school system should be reformed, rejecting both the right and the left wing establishment in the process. This is some achievement.” Michael Shayer, Emeritus Professor of Applied Psychology, King’s College, London. This book argues that there is an urgent need for a fundamental change in the direction, governance and public accountability of the English education system. This is a view that is widely shared by education professionals, teachers and increasingly parents, but it has not been at all reflected in the mainstream media. There are a number of things that make Roger Titcombe’s polemical guide so unique. It is written by a teacher but it is not exclusively for teachers, although many will find it essential reading. It combines gritty, no-nonsense analysis with powerful personal stories that show beyond doubt that a toxic cocktail of factors have poisoned our school system. 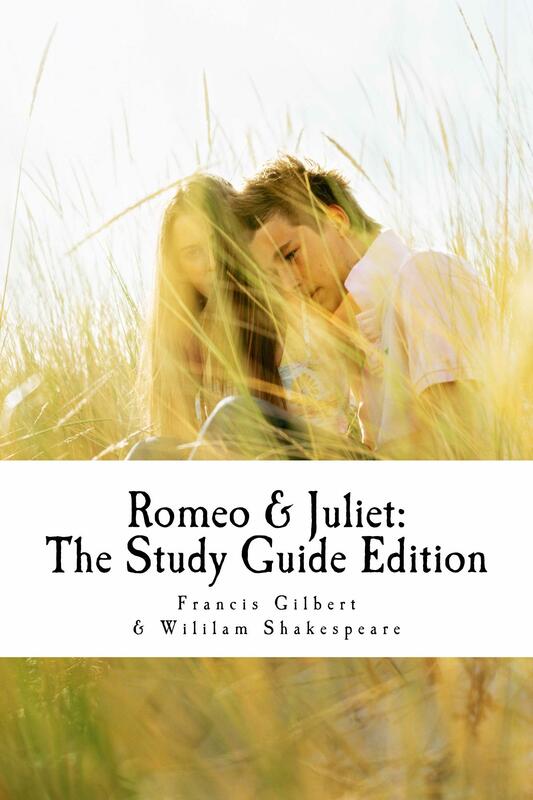 Romeo and Juliet: The Study Guide Edition out now in paperback and Kindle! 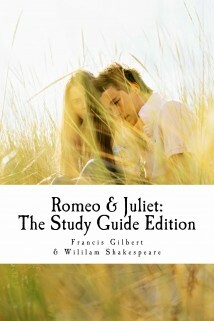 You can buy Romeo and Juliet: The Study Guide Edition in paperback or Kindle. “Clearly Francis Gilbert is a gifted and charismatic teacher,” Philip Pullman, author of ‘Northern Lights’. “Gilbert writes so well that you half-suspect he could give up the day job,” The Independent. “A great teacher,” Jeremy Paxman on BBC’s Newsnight. Are you struggling to understand Shakespeare’s classic play ‘Romeo and Juliet’? Are you a teacher who needs a really good edition of the play which will enable students to understand the play’s complex language and cover all the key areas required to get a good grade in an examination or coursework? This brilliant edition of Shakespeare’s great love story may be the answer to your prayers. Written by a teacher who has taught the text for more than twenty years in various secondary schools, this version is aimed at students who must analyse the text in depth or teachers wanting to deliver outstanding lessons on it. The book contains the complete text together with a parallel modern translation, which most students will be able to read independently or in small groups: the language is entirely appropriate for ages 11-18 years. The text is broken up by exercises on every important section of the play, with fill-in-the-gaps tasks to check understanding, questions to aid in-depth analysis, creative response tasks and tips on acting out the play. The first section of the book is an up-to-date study guide which explains the plot, characters, language and imagery in detail, with visual diagrams and links to relevant websites. The final section of the book contains an exhaustive explanation of how to write top grade essays on the play, including sample A* answers as well as summaries of significant literary criticism. There are plenty of pointers to help students develop their own personal responses, including thought-provoking thematic questions. It checks basic understanding by providing fill-in-the-gaps exercises on every important part of the play. It looks at why students should study ‘Romeo and Juliet’. It examines Shakespeare’s story, looking at the structure & themes: love, hatred and the feud, fate and the use of time. It discusses the contexts (the background) of the play: its different versions, including Brooke’s poem upon which the play is based, Nashe’s ‘Have With You to Saffron Walden’ (1596)and ‘A Midsummer’s Night Dream’. It investigates the nature of Shakespearean tragedy, discussing the rules Aristotle set out for this genre. It explores the world of Shakespeare’s theatre and The Globe, discussing social and political contexts. It provides an overview of various productions of ‘Romeo and Juliet’. It contains a detailed section on Shakespeare’s language, examining his imagery and grammar, exploring his use of nouns, verbs, adjectives and adverbs. It contains a very helpful section on his use of rhythm and rhyme, setting exercises which will help students really understand this complex subject. There is a long section on his use of characterisations, discussing all the main characters in depth. As well as the play itself and a very accessible modern translation of it, there is a detailed summary of every act and scene. There’s an excellent glossary of all the difficult words, including vocabulary students need to learn. There are a number of speaking and listening activities that are very easy to do and really aid understanding. There is a readable account of the literary criticism of the play which looks at feminist, Marxist, cultural materialist and queer theory approaches to the text. There is a detailed account of how to write a good essay on the play which includes a dissection of sub-standard essay and an example of an A* essay. Finally, there is a section which helps students compare the play with filmed versions & performances. Why did I set up FGI Publishing? I have set up my own publishing company, FGI Publishing, because I want to promote books which are genuinely useful, informative and engaging. I began by publishing my own books but I am now branching out to publish other people. 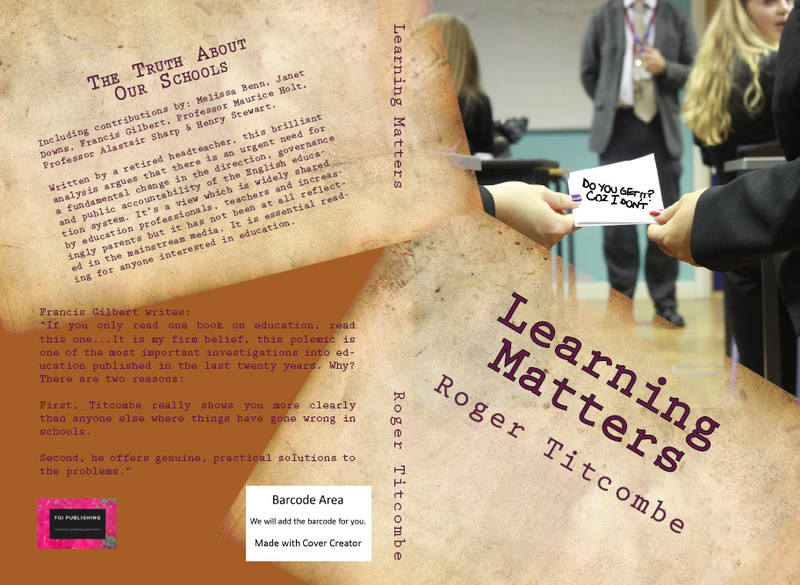 In the near future, I will be publishing Roger Titcombe’s Learning Matters, an essential guide to the inner-workings of our education system and how children learn. Roger’s book is packed full of important research into the ways in which the English education system has both failed and succeeded our pupils. I aim to expand the remit of FGI Publishing in the future. I’m interested in looking at submissions which are well-written, original, imaginative and socially relevant, whether they are fiction, non-fiction, drama or poetry. I am not seeking to publish genre fiction at this moment in time, but if a writer feels they have invented a new genre then I may consider a proposal. At the moment, I am using Amazon’s CreateSpace platform to publish paperback books on, and using Amazon’s Kindle Direct Publishing to publish e-books on Kindle: this means all FGI Publishing’s books are available on all Amazon websites across the world. However, I may use other platforms and printers to publish books in the future. What do I offer writers that other publishers don’t? First, I offer much more generous royalty rates than most publishers. Second, I have good contacts in the media world and feel I can promote a book I believe in. Third, I have quite a bit of experience of publishing my own books and so know the pitfalls regarding publishing books. What is to stop me self-publishing my own book? Nothing whatsoever! It’s never been easier! And if you’re interested in doing that, I would urge you to do so. However, I’ve found that some people like to work with someone else who believes in their book, and also feel that they lack the technical expertise or the time and energy needed to self-publish. How do I submit a proposal? Please email FGIPublishing@gmail.com with a short synopsis of your book and a sample chapter if you are interested in me publishing your book. What books have been published on FGI Publishing? So far, I have published a number of my own books using the FGI Publishing imprint.